Every student knows that it’s not an easy job to get a creative idea for their semester project, During selection of our semester project, I and my friends were busy to get some cool idea for our project. One day an idea comes into my mind that we have a stopwatch in our cellphone and digital watch in our hands but we can not use them during race competition or any other sports activity due to it,s smaller size for the public crowd. 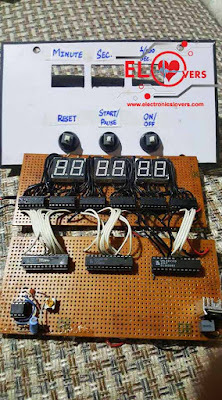 I start thinking that why not to make a large stopwatch by using multiple seven segment display. I discussed this idea with my friends and it was good news that they liked my idea. 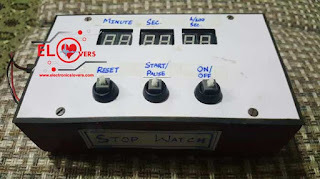 Our first aim was to design a virtual model of our Digital Stop Watch in Proteus simulation software tool to verify our design before going to hardware side. After designing a circuitry in Proteus as you people can see in the given picture, we start writing our code in assembly language for this project. After continuous efforts Finally, we get a Hex file from our code. We tested and verified our code in Proteus simulation software tool and it worked like a charm, I remember that feeling and happiness on our faces when our project runs successfully in Proteus. After that, we decided to move on to hardware side, we bring required components from an electronic shop. 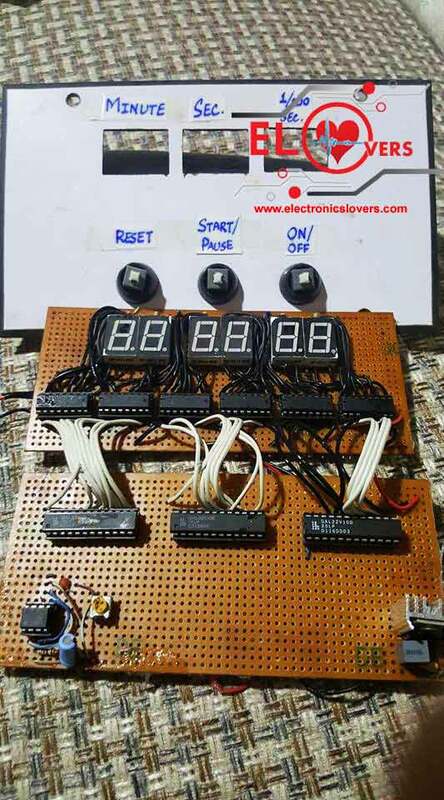 We used 6 seven segment displays in this projects as you can see in the given pictures, you can use Larger size seven segment display in the future for the creation of mega Digital Stopwatch. We can use this project everywhere where Large Stopwatch needed. 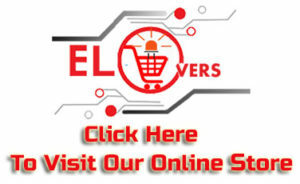 You can make your own too by using our source code and schematic diagram, don’t hesitate to ask your questions from us we are here to help you anytime. This Project is Made by M. Rehmatullah, M. Rameez M. and Hamza Naeem From Dept. Of Applied Physics, University of Karachi.